Using the latest Evernote technology, Hollandcodes.com has launched new virtual catalog. Hollandcodes.com Virtual Catalog web page overviews - Click on the link to view the web page. Hollandcodes.com Virtual Catalog web page - Read about the different Hollandcodes.com products and topics. Click on the Let's Connect and Build a Stronger Network! link to connect with us using Facebook, Twitter, and Linkedin. 1. 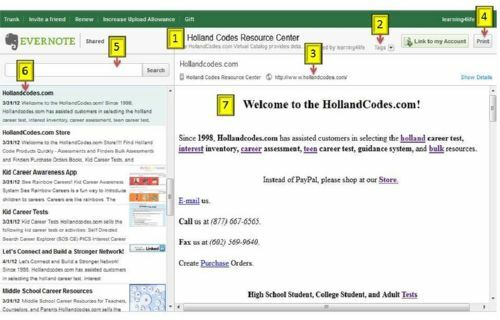 Click on the Hollandcodes.com's Virtual Catalog link. 2. Use the scroll bar on the right of area number 6 to view Hollandcodes.com products and topics. 3. Click the links (number 6) to open the Virtual Catalog web pages. The web pages will open in area number 7. 4. Click the web link (number 3) to open the original Hollandcodes.com web page. The virtual catalog and other resources are on the Resource Center.